Guests who joined the celebration were Board President Butch Mach, Interim Artistic Director James Black, and Twelfth Night Director Jonathan Moscone (Born Yesterday, Amadeus, Vanya and Sonia and Masha and Spike). The seated dinner at the Alley, catered by A Fare Extraordinaire, featured Rosemary Tomatillo Chicken Breast served with Baby Kale, Barley, and Butternut Squash Salad, Dried Cherries and Spiced Pistachios and sweetly topped off with a dessert of Persimmon Parfait. Alley Theatre Managing Director Dean Gladden welcomed guests to the Opening Night Celebration and also acknowledged the retirement of Ten Eyck Swackhamer, who served his final week as the Alley’s general manager. Jonathan Moscone in his fourth time directing at the Alley, shared his passion and love for the Theatre, this production, and for the “bar none” Alley production staff. Describing the production as rich, romantic, and funny, he expressed his gratitude to be able to share this play with Houston audiences. 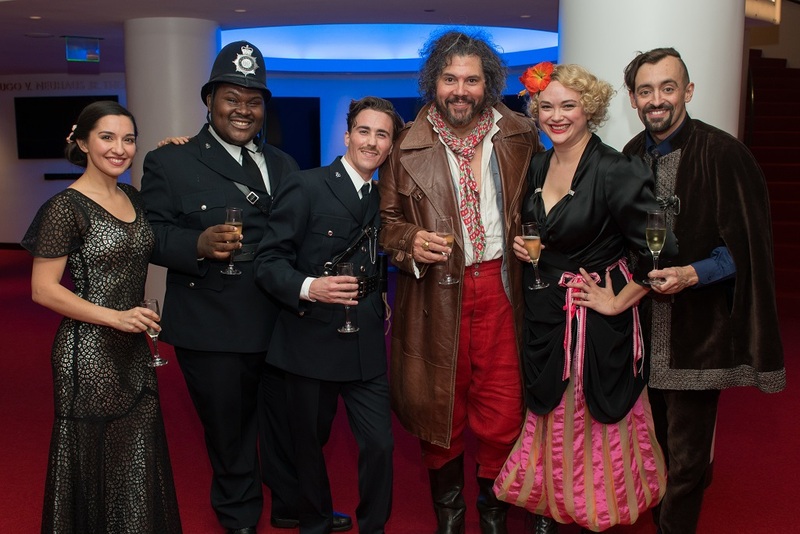 Following the play, guests were treated to a champagne toast in the lobby of the restored Neuhaus Theatre where they mingled with the cast and crew.